Stick and spray for fabric is a repositionable fabric adhesive designed to temporarily bond fabrics. It can be used for applique (including machine applique), stencilling, quilting, tacking, hemming and holding fabric to stabilisers in hand and machine embroidery. The product is free from harmful acids and dispense as a fibrous mist which is odourless and colourless. It won't spot fabric or foundation material and doesn't gum sewing needles. Please note: the shelf life for this product once opened is 12 months if stored upright and in accordance to the information given below. Caution: for your safety, use only for its purpose and in accordance with the instructions. Extremely flammable. Vapours may cause drowsiness and dizziness. Keep away from sources of ignition. No smoking. Keep out of the reach of children. If swallowed, seek medical advice immediately and show this container or label. Pressurized container: protect from sunlight and do not expose to temperatures exceeding 50°c. Do not pierce or burn, even after use. Do not spray on a naked flame or any incandescent material. Use only in well-ventilated areas. For your safety, use only for its purpose and in accordance with the instructions. Never spray during a party. Never spray on a Christmas tree where electrical lights are used. Never spray on the body or the hair. 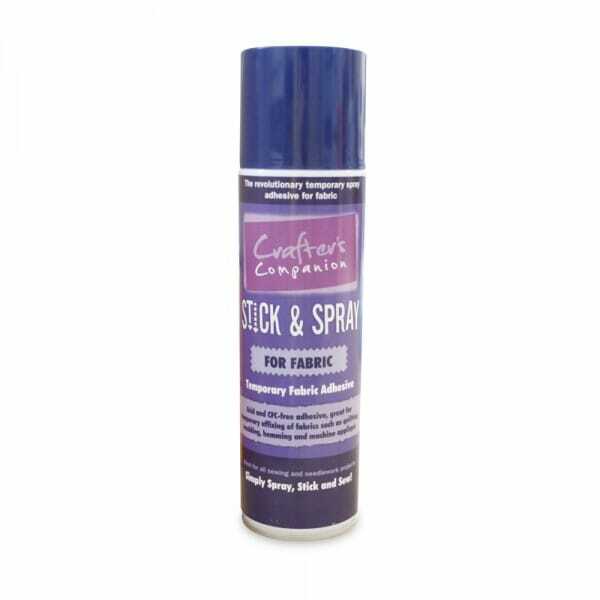 Customer evaluation for "Crafter's Companion Stick and Spray Adhesive for Fabric - Violet Can"